Jackson is 18 months old! At his well child doctor's appointment he was in the 50th percentile in weight and the 75th percentile in height, so he's definitely growing! He's talking more and more too. We don't always know what he's saying, but talks almost non-stop. He mimics almost anything you say too, which can be good and bad! He loves to dance and sing. 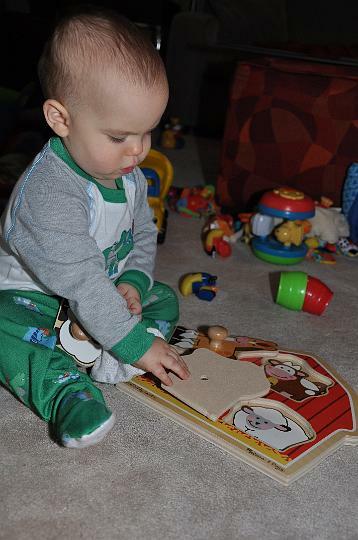 Some of his favorite songs are the ABC's, Ring Around the Rosie, and If You're Happy and You Know It. With the last two he does all the right actions too! He also cheers at the end of a song whether he knows it or not. It's a great confidence booster if you're like me and really can't sing! He sort of counts to 10. He seems to know the numbers and will say them occasionally when you're counting. If you use your fingers and stop at 4 or 9, he'll grab your thumb and say FIVE or TEN! He's using sign language more and more. He's had a lot of the eating signs down for a while, but he's even learning colors now. He usually says the word along with the sign. It's pretty amazing. We've had to look things up a couple of times because it was clear he was signing something, and we had no clue what it was. On the eating front, he's learned to drink from a cup. It's still a messy process from time to time, so the sippy cups are definitely still around. 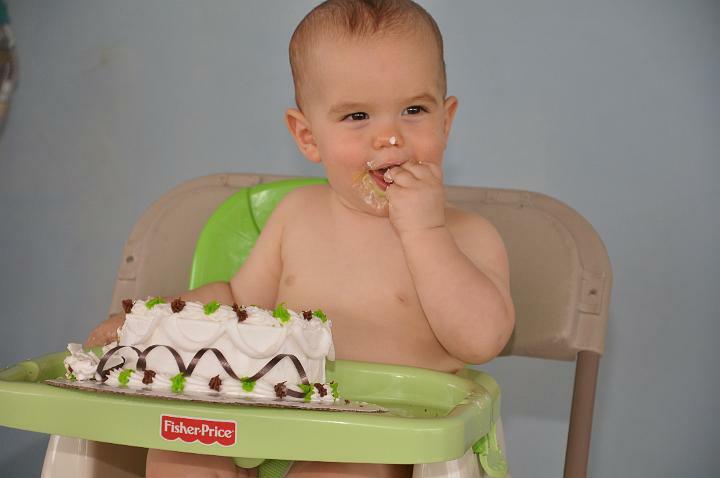 He's using his fork and spoon fairly well, but still says "help, please" a lot. He's also a very sweet little boy. He loves to give everyone hugs and blow them kisses. Bailey is one of his favorites to hug, and it's torture for her. She gets him back with kisses though, which is torture for him (most of the time he really loves it and just laughs uncontrollably). We figure it's pretty fair. He's a lot of fun these days. His laugh is by far the best noise in the world, and we get to hear it pretty often. He is a very happy boy overall. He certainly has his moments, and "mine" has quickly become one of his favorite words...we're trying to teach him the alternative when he says it. We're also trying to explain that he'll be a big brother soon. I'm not sure he understands that one yet! 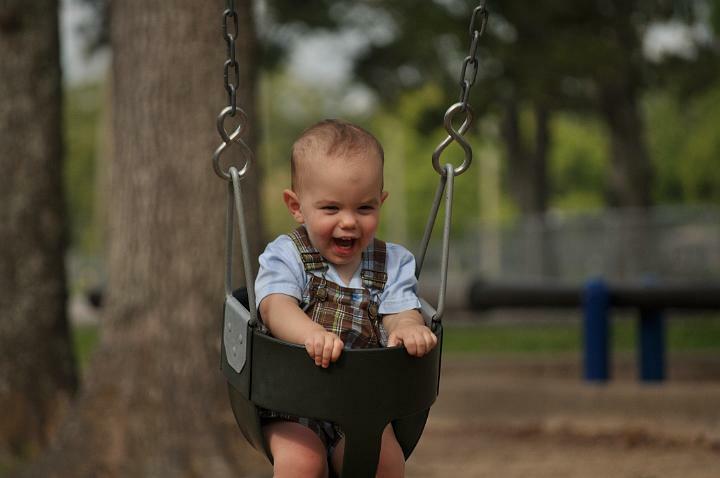 13 months old here - He still loves to swing, but that permanent bruise in the middle of his forehead from learning to walk is finally gone...not to say that he doesn't fall from time to time still. 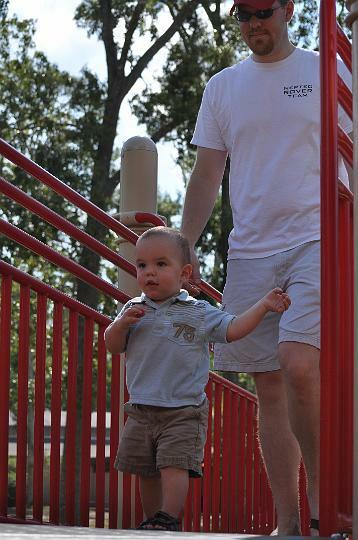 14 months old here - At some point he started walking with his arms down, and he now runs a lot too. Chasing Bailey is another of his favorite activities. 15 months old here - He still gets a kick out of watching a baloon float away. 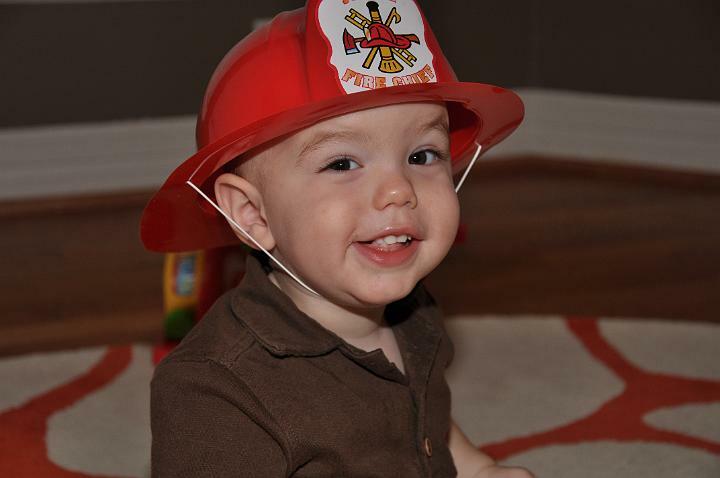 16 months old here - The fireman hat is still a favorite too. 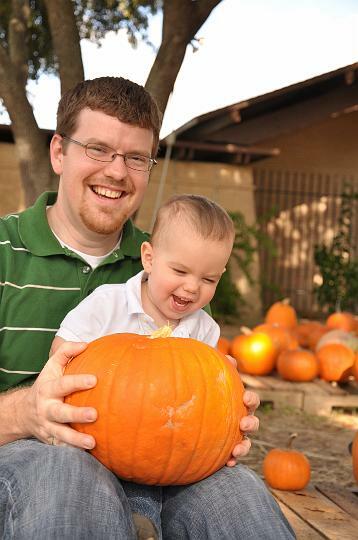 16.5 months old here - His Dad can ALWAYS make him laugh. 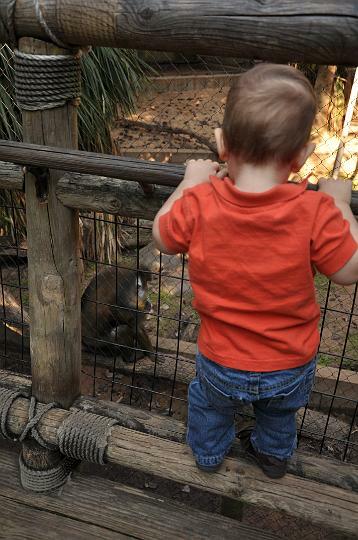 17 months old here - He is fascinated by animals...especially the monkeys at the zoo. 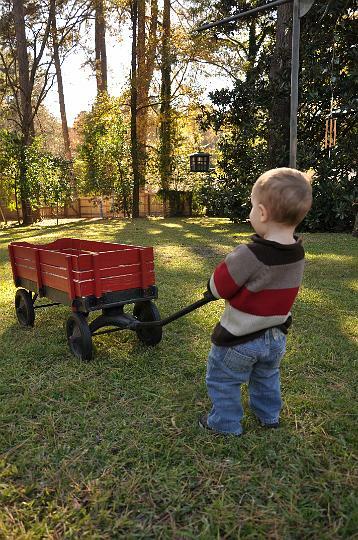 17.5 months old here - He loves the wagon, but prefers to be pulled around. 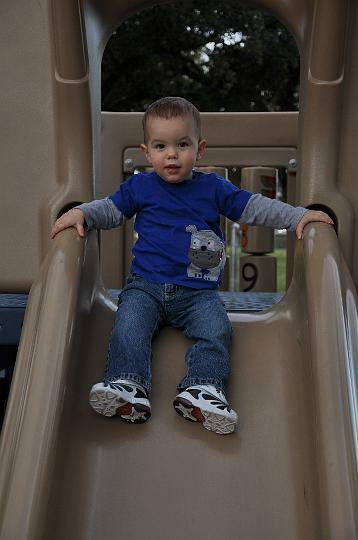 17.5 months old here - Slides have quickly become a favorite at the park too. 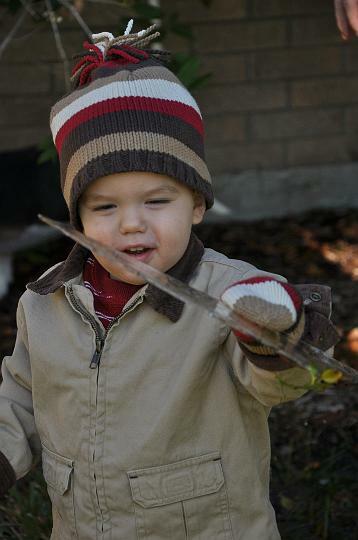 18 months old here - And he's more curious than ever...not to worry, he didn't hold the piece of ice for long. It's hard to believe 18 months have already gone by, and we'll soon have a baby girl to love and adore too. It's such an amazing and challenging journey! We're loving (almost) every moment! What a good lookin' young man. Good job guys!